Chances are pretty good if you’ve been part of the hip set over the past decade (hard to believe it could be so long) you’ve probably eaten at Bubby’s. Granted, TriBeCa is not as white hot these days as it was 10 years (or more!) ago, but there you have it. The cow marks the spot. So what is Bubby’s? It’s an upscale, “country-fresh” diner that touts itself on its comfort food essentials. Previously when I’ve been there, I’ve indulged in their mac and cheese (to be reviewed later), but I gather that their breakfast is also incredible. As it happened, I had occasion recently to sample one of their signature breakfasts, their ludicrous pancakes. That's 10 tons of pancake. 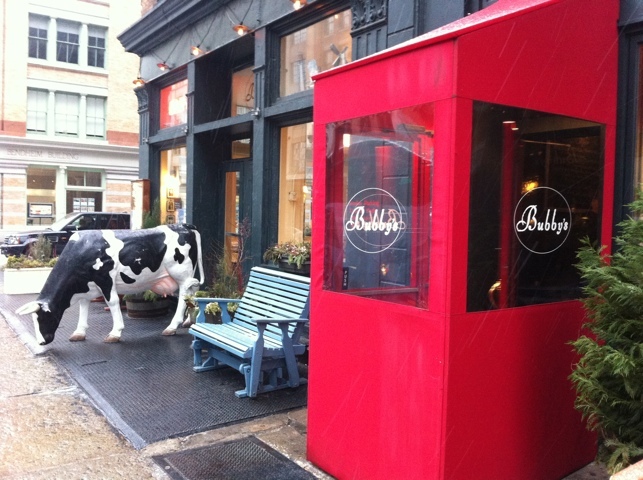 I came to understand that Bubby’s is known for their breakfasts, in particular their pancakes. They are so large and fluffy that they more closely resemble something that the incredible Hulk might eat. Mere mortals need not apply. I managed to eat about half of the portion. I sampled their banana walnut variety, which came highly recommended. The bananas are nicely sizzled. The walnuts interrupt the mush of the fluffy pancake with the occasional hearty crunch. 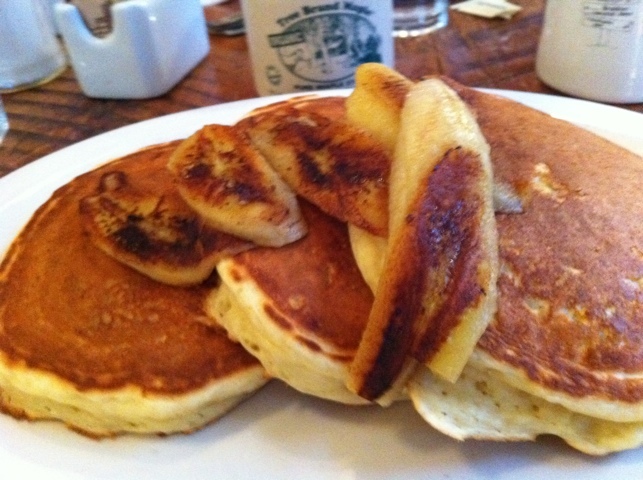 The bananas – and ladling of butter and real Vermont maple syrup – just add to the insanity. One of these days I am going to have to go there and eat a proper breakfast. This was frankly too much for me. That said, if you like pancakes, you’ll love it.